The Newest Rant: Flashback Friday: Wolverine Weapon X Volume 2: Insane in the Brain. 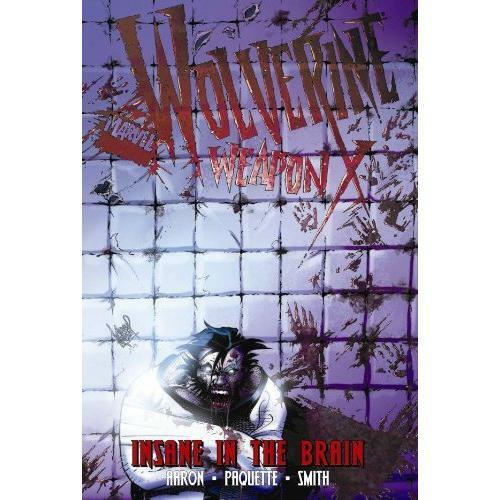 Flashback Friday: Wolverine Weapon X Volume 2: Insane in the Brain. Wolverine Weapon X: Insane in the Brain. Collecting issues #6-10 from the long-ago time of 2009 (yeah, my Flashback Friday's sometimes are more recent than other stuff, I'm weird) this was a great four-issue story arc about Wolverine in a twisted psychiatric facility and an extra issue about his past with women. It's utterly insane and zany and I loved it the first time I read it. Issue #6 opens an unclear amount of time after the end of the first action-movie-styled arc and seems to be the kind of crazy stories Aaron loves to write. 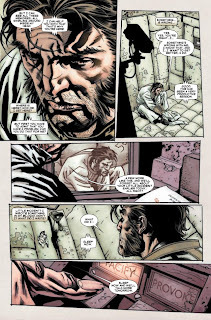 The interesting thing is, Logan is locked up in a creepy asylum where things definetely aren't right--but he is completely passive about the whole thing. We hear him talk about how he remember going to space and having friends who can teleport, and how it all just sounds so...crazy. 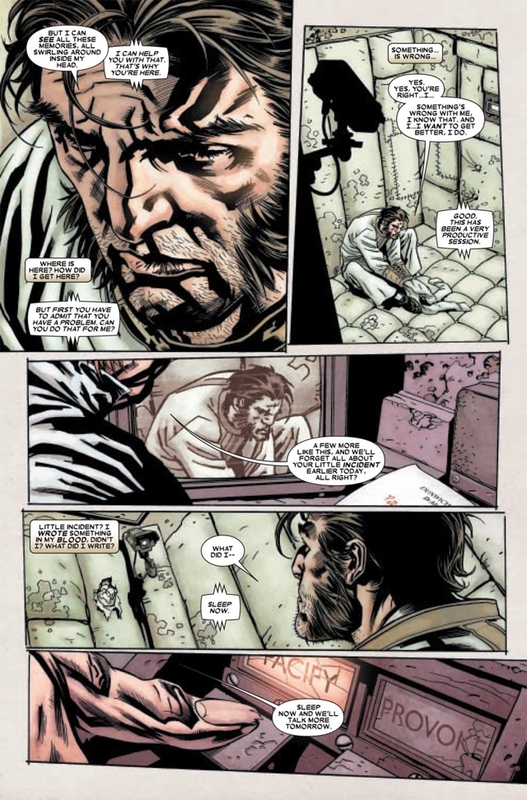 Its humorous to think about how someone who has lived such a strange live as Wolverine's could possibly exist, and if they thought they had gone through his experiences wouldn't they sound deranged? I probably love these early issues the most because you keep wondering when Wolverine is finally going to crack and the crazy action is going to go down. When the action starts up, boy is it bloody and crazy. I'm talking Wolverine getting his eyes poked out, the villain of the piece, Dr. Rotwell, getting sliced up brutally, and other stuff that makes me wonder how this comic avoided a "Marvel Max" label (probably because the action is sort of cartoony). Anyways, in between the weird brain-machines and appearances by Wolverine's teammates Psylocke and a then-alive Nightcrawler, along with his new girlfriend, this is a fun and wild ride. Issue #10 has some cool art by C.P. Smith and is about Wolverine reflecting on his past relationships and how they usually didn't work out well. 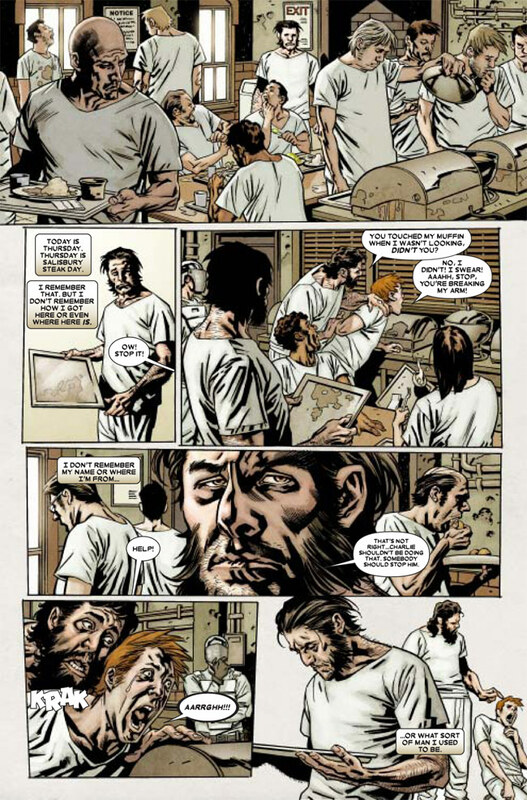 It features guest appearances by everyone from Emma Frost to the always-great Luke Cage and Jessica Jones, plus it has a surprise reveal at the end of the story that hinted at the current shenanigans with the surprise character that took place in the new Wolverine ongoing also written by Jason Aaron. It's a solid issue full of fun conversations and shows the sensitive side of Wolverine that we don't always get to view. It makes a good mellow closer to what was earlier an utterly bizarre romp. Wolverine reviews his complex romantic history. 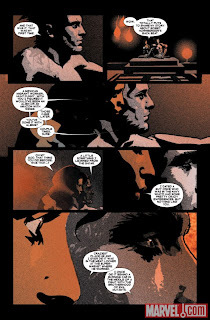 During the short run of Wolverine Weapon X this was probably my favorite part of the run, from the violent madness of the mental facility to the quiet sweetness of issue #10. It's some great stuff and shows Jason Aaron at his nuttiest best. 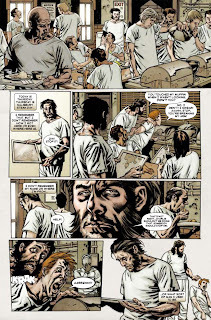 Wolverine: Weapon X, Vol. 2: Insane in the Brain for some wild fun.